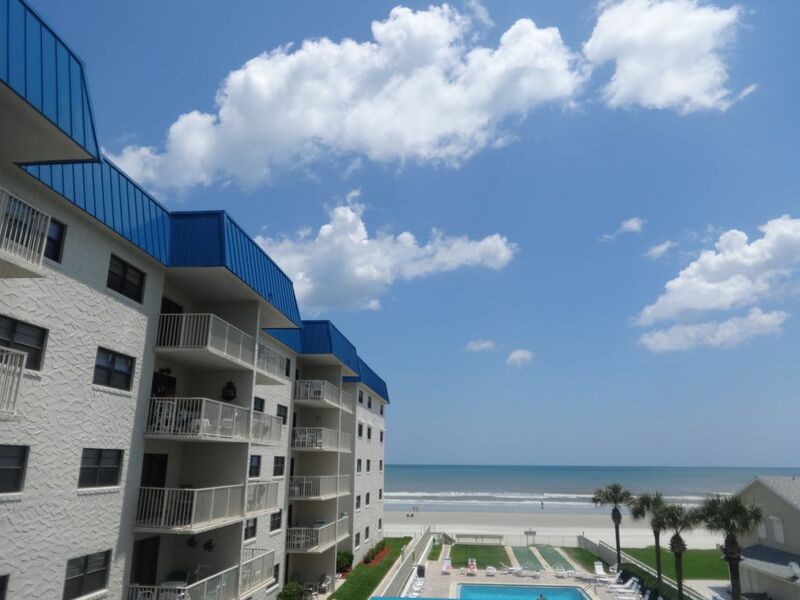 Enjoy a wonderful Florida vacation in the comfort and convenience of your own private condominium on one of Florida's safest and most beautiful beaches. Located on the safe non driving section of the beach. Friendly and affordable, this attractive oceanview condominium has one and a half bedrooms and sleeps four people comfortably. The master bedroom has two windows for cross ventilation to compliment the air conditioning and has a new king-sized sleep set for your comfort. Along with the bonus bedroom containing bunk beds, there is a queen sized sleeper in the living room. The fully equipped kitchen contains all you need to eat in, and the living room and balcony overlooks the pool with a wonderful view of the ocean. The dining area has seating for four. The condo is located on the third floor of a friendly, family-oriented, five-story complex with 50 units. Hacienda del Sol I is a small family oriented community that is very quiet and friendly. It is the perfect size to enable you to get to know your neighbors and not feel lost or alone in a massive complex. Wake up to beautiful sunrises on 10 miles of beautiful white sand and rolling waves. Spectacular view of the Ocean from your balcony! Gorgeous view of the sunrise daily as it comes up over the Atlantic. High speed Wireless internet signal exclusive to the unit. Internet also available by pool and cabana. 2 sofas and swivel chair. 43” HD Smart TV flat screen with DVD player and DVR. Full set of matching dinnerware and utensils. 50' Flat screen Smart Tv with 120 channels and Personal Video recorder in Living Room. 32” Smart TV in bedroom. (2) 120 channels of digital tv with DVR in Living Room. Private balcony with terrific view of Ocean and pool. Table and chairs for out door dining. Heated pool and Kiddie pool in fall , winter and spring. Thank you for a stress free, phone free, tv free Holiday Week. Perfect family time. Thanks very much for taking the time to review your stay. Every review helps us to understand what renters want and enjoy about our condo. Clean and comfortable / great view !! Hi Sue & Jim, many thanks for taking the time to review your stay at our place. Your words accurately express the conditions and values that we have tried to represent in our condo. Reviews from renters like yourself really assist in keeping us up to date with what our renters want and appreciate. My wife and I spent a week at Hacienda Del Sol - Unit 301. It was a corner apartment on the third floor and that was a quiet location in the complex. Overall, during our stay, the complex was busy, but quiet. We hope to return during the fall for an off-season visit. The apartment matched all of our needs. The bed is huge and comfy and a great surprise. The kitchen is well-stocked and all the appliances were fine. The docor is beachy and nice. There is a big TV in the living room and a smaller version in the bedroom and both worked without problems, as did the easily accessible WIFI connection. The pool is nice although it was over-run with kids since we were there in the summer vacation season. The walk to the beach is easy and it is a nice, no-driving stretch so evening walks were pleasant and peaceful. There are lifeguard stands right there so it is a safe beach in which to frolic. We even got in a bit of successful catch-and-release surf fishing. The complex is an easy six minute drive to the main venues in New Smyrna and easy access to Canaveral Seashore downstream on the coast. We had several communications with the owner, Bob, and he was always helpful and pleasant. Overall an A+ stay. The condo was adorable. Everything you need is right there. The bed was super comfy. There are beach chairs, boogie boards and even a sun tent to use. The condo is just steps from the ocean! The property manager is very helpful with anything you need. Most of all, the owners, Bob and Sheila, are so nice and accommodating. We loved this place and will be back! Many thanks for your kind words and for taking the time to express them. We really do appreciate renters like yourself who recognize the care we take with our condo to make it warm and welcoming, and who care enough to share their experience with others. Getting good reviews allow us to make sure we are always meeting the needs and wants of future renters. Wow! We really hated to leave Bob & Sheila's place. From the moment we arrived, we knew we'd be coming back. Their location is amazing. Sitting in the balcony for breakfast and resting on the balcony at night, we listened to the waves breaking just a short distance away. Their place was very clean and just perfect size for us. Loved having a Dollar General Market right across the street. The pool was refreshing. We had fun taking our chairs to the beach (we brought our own but didn't need to) to watch the full moon rise and watch the crabs come up to feed. We found lots of shells. Everyone at the Hacienda were friendly. We met many people who had connections to Iowa, our home. Would highly recommend this property. Bob & Sheila were wonderful to work with. They made us feel so welcome. Thank you for sharing your little bit of paradise! Hi Mary, thank you very much for your glowing review. Your description almost made us want to hurry back down although we had just left. We appreciate your kind words and you for taking the time to review our place. We look forward to your next visit. Very well maintained and clean. HI Steve, thanks very much for taking the time to review your stay. We are happy you found the place clean and comfortable and glad you had a relaxing vacation. Please keep us in mind for future Florida trips. Owner will make a call to the renters in the days following arrival to ensure complete satisfaction with rental.